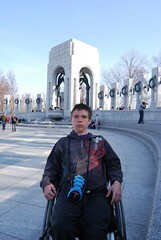 The World War II Memorial was the final memorial we visited as part of our day exploring the National Mall. By the time we got to it Mik was tired of sightseeing. Plus, we have been to it many times before and it just is not among his favorites. He did let me take one picture of him at it, but we pretty much just quickly rolled around it and headed to the Metro. The World War II Memorial is one of my favorites, as I like the pillars with the states and US territories. The path around the pillars is ramped, but it can easily get crowded. We walked around the outside at one point to try to avoid the crowd inside the memorial, but the path is much smaller and is not really worth it. Sometimes, though, this is the better way to get pictures with specific pillars without other people getting in the way.